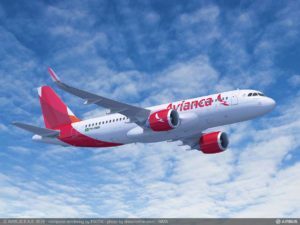 Synergy Aerospace Corporation, largest shareholder of Colombia-based Avianca and owner of Avianca Brasil, has finalized a Purchase Agreement with Airbus for 62 A320neo Family aircraft. These A320neo will be the base of the fleet renewal and network growth strategy for Avianca Brasil, and also marks over 1,000 Airbus aircraft sold in Latin America. Synergy became an Airbus customer in 2007 with its order for 10 A350 XWBs. It also has ordered 20 A320 Family aircraft, six A330-200 passenger and one A330-200 Freighter. Today, Avianca Brasil operates 40 A320 Family aircraft and one A330 Freighter. Growing at a favorable rate of 5.3 percent annually, intra-regional and domestic traffic in Latin America is expected to almost triple in the next 20 years. The single-aisle aircraft is Latin America’s linchpin, and the A320neo will play a key role in securing this future market. With over 1,000 aircraft sold and a backlog of more than 450, over 600 Airbus aircraft are in operation throughout Latin America and the Caribbean. In the past 10 years Airbus has tripled its in-service fleet, securing over 60 percent of orders in the region since 1990. The A320neo has become the undisputed aircraft family of choice for Latin America, now with 410 firm orders, plus 58 commitments with lessors, from seven customers winning nearly 70 percent of orders in the new generation single-aisle aircraft market. Satair Group’s support in the Americas is being dramatically enhanced with the opening of a new state-of-the-art support facility in Miami on April 19th 2016. Located just seventeen miles and 20 minutes from Miami International Airport, the 25000 square feet multi-million dollar building is four times the size of the previous facility. The new facility will host Airbus proprietary parts commonly used by the region’s customers. In addition, it will accommodate a dedicated repairs area, a HAZMAT (hazardous material) centre of excellence, and it will feature modernised production of aerospace hose products. In support of the Eaton’s first class products lines, Satair Group has equally made a significant investment in its production facility and modernisation of tooling to ensure the highest product reliability and satisfaction. John Gattasse, Head of Latin American Sales and Support for Satair Group Americas stated: “The economic situation in Brazil and Argentina has had an effect across the Continent but we see the indications that growth will resume. The timing of this major investment means that Satair Group is positioning itself for the future in the Latin American aviation market. The growing success of airlines in Latin America means there are now major carriers in the region and we continue to work hard to support them”. Mike Heaton, Managing Director of Satair Group Americas ends: “This new Miami based facility will allow an improved logistical availability for many customers, and will provide an excellent platform for Satair Group to extend and improve our service offerings in the Americas overall and in particular for our Latin American customers. In addition, our existing Miami employees do a fantastic job, and I am pleased that they will be able to work in this new facility that supports their excellence and commitment”. April 12, 2016 (Shanghai, China): Dassault Aviation’s new flagship, the Falcon 8X, will be on hand at the Asian Business Aviation Conference and Exhibition (ABACE) in Shanghai, the ultra-long range trijet’s first appearance in China. The exhibit, which opens at Shanghai’s Hongqiao Airport on April 12, will feature aircraft s/n 03, the first 8X fitted with a fully equipped interior. S/n 03 is in the midst of a four week 55,000 nm (101,860 km) global proving campaign designed to simulate the most extreme real world conditions customers might expect to face during their aircraft’s operational life. The campaign will take the aircraft through 65 different missions, from short hops to ultra-long range flights. It will focus particular attention on the performance of cabin equipment and functionalities and high speed communication systems during long, intercontinental flights. The three aircraft in the Falcon 8X flight test program have nearly completed all certification test requirements and to date have accumulated over 650 flight hours in 325 flights. FAA and EASA certification is expected by midyear and entry into service in the second half of 2016. With eight passengers and three crew, the Falcon 8X will be capable of flying 6,450 nm (11,945 km) non-stop at M.80 and will be able to connect Beijing with New York; Hong Kong with London and Shanghai with Los Angeles. The aircraft will feature a cabin 1.88 m (6 ft 2 in) high, 2.34 m (7 ft 8 in) wide and 13 m (42 ft 8 in) long and offer customers the most diverse selection of cabin layouts on the market — more than 30 configurations in all. It will be available in three galley sizes, two with a crew-rest option. Operators will have an extensive selection of passenger seating areas of varying lengths capable of supporting different lavatory layouts, including a lavatory with shower. The Falcon 8X will be equipped with three PW307D engines delivering 6,722 lbs of thrust each – a 5% increase compared to the PW307A that powers the Falcon 7X. Combined with improvements to wing design, the new power plant will make the 8X up to 35% more fuel efficient than any other aircraft in the ultra-long range segment and offer a significant decrease in community noise and NOx emissions. After undergoing thermal, acoustic and cabin amenity testing at the Little Rock Completion Center, s/n 03 went through a campaign of cold soak trials at Ranken Inlet, Nunavut, on the northwestern shore of Canada’s Hudson Bay, intended to demonstrate aircraft system functionality under extreme weather conditions. During these tests, conducted from March 9-11, all systems, including avionics, electrical, hydraulic and digital flight control systems, performed flawlessly despite temperatures that dipped as low as -27° F (-33° C). The campaign included ground testing of cabin systems after APU startup and cabin warm up and an in-flight demonstration of full capability under extreme cold conditions. As the flight testing and certification campaign nears completion, production and support activities are moving into high gear. Falcon 8X s/n 21 recently entered final assembly in Bordeaux-Merignac and six airplanes are now in completion in Little Rock. Dassault Falcon Jet recently completed work on a new hangar in Little Rock to handle 8X completions and broke ground on a new six-bay hangar at Bordeaux-Merignac to provide additional maintenance and repair resources for the 8X and 7X models. In addition to the quietest cabin and the most advanced digital flight control system in business aviation, the big trijet will be available with Dassault’s new FalconEye Combined Vision System, the first head up display in the industry to combine synthetic and enhanced vision capabilities. Derived from the popular Falcon 7X, the ultra-long range Falcon 8X was unveiled in May 2014 at the European Business Aviation Convention & Exhibition and first flew on February 6, 2015. The 8X will offer the greatest range and the longest cabin of any Falcon and feature the 7X’s exceptional operating economy and short-field performance. Dassault Falcon will be at Chalet S11 during ABACE. April 12, 2016 (Shanghai, China) – Several years of continuous investment in the Dassault Falcon customer service network in China have led to a sizeable increase in customer support activity, bringing significant added value to Chinese operators and transient customers. · Establishment of Dassault Falcon Services-Shanghai, a joint venture between Dassault Aviation and Shanghai Hawker Pacific, in 2012. Located at Beijing Capital Airport, Deer Jet is one of the largest business jet operators in the Asia Pacific region. 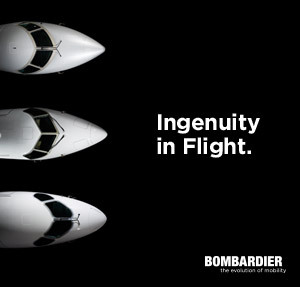 It manages and supports a large fleet of business jets, including the 7X. The partnership with Dassault covers light line maintenance (up to 2A and 2A+ inspections) and unscheduled maintenance on Chinese registered Falcon 7X aircraft at Deer Jet’s Beijing facility. Since the Dassault agreement went into effect in May 2015, the facility has supported about 100 routine servicing and maintenance events. Deer Jet has also applied for full FAA repair station approval. Currently, the company maintains three technicians on staff dedicated to supporting Falcon customers, including provision of 24/7 AOG support. Dassault Falcon Services-Shanghai offers a full range of MR&O services, from heavy maintenance through A and B checks. Staffed by a team of Dassault trained technicians with an average experience of more than 10 years on Falcon business jets, it is equipped to handle line and base maintenance for aircraft registered in China, Hong Kong, Macau, Isle of Mann, Bermuda, the U.S. and the Cayman Islands and can handle all current production Falcon models. The facility reported a nearly 40% increase in larger scheduled maintenance events last year. The new Beijing customer service office has focused special attention on reinforcing local access to spare parts. The office is staffed with Field Technical Representatives and Customer Care Managers specialized in spares, warranty issues and other operational matters. Maintaining a large Falcon spares inventory in China facilitates customer component exchange transactions, affording a significant time savings and sharply reducing duties and taxes. Combined with other spares depots in the Asia Pacific, this inventory allows operators to immediately access the top 3,000 high demand parts for in-production aircraft. Since early 2015, the Falcon spares value level based in China has risen over 10%, to almost $6 million, bringing total inventory in the region to more than $35 million. This spares commitment has been accompanied by efforts to expand tooling inventory made available to Falcon operators through a rental pool. Dassault Aviation will again hold a Falcon Maintenance and Operations (M&O) seminar in conjunction with ABACE. The M&O seminar will focus both on operations and technical issues of concern to Chinese customers and is designed to help aircraft operators improve the efficiency, reliability and safety of their operations. Topics will range from the latest customer service and engineering support initiatives to enhancements in troubleshooting and product reliability. David Brigante, ATR’s Senior Vice-President Procurement highlighted that “the aim is to provide our operators with a broader scope of customization possibilities. The signature of this contract perfectly fits into our philosophy of continuous improvement of our aircraft, its performances and the services we bring to the 200 airlines operating ATRs worldwide”. · Ofrece una plataforma única de intercambio para pilotos y mecánicos certificados por Airbus Helicopters. · Se estima un potencial de 3000 miembros en América Latina que podrán compartir experiencias en español. Santiago, 31 de marzo de 2016 – Airbus Helicopters ha lanzado hoy en FIDAE el HPilot Club en Latinoamérica. 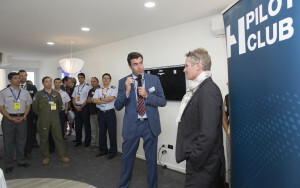 El objetivo del HPilot Club- cuyo lanzamiento oficial tuvo lugar en Junio de 2015 durante el Paris Air Show- es reunir a pilotos y mecánicos certificados por Airbus Helicopters así como propietarios de helicópteros en una sola comunidad. Fort Worth, TX (April 6, 2016) Bell Helicopter, a Textron Inc. (NYSE: TXT) company, announces plans to showcase the performance capabilities and luxury interior of the Bell 429 MAGnificent through a series of customer demo flights in South America. Bell Helicopter last demonstrated the Bell 429’s capability in a five-month demo tour in 2014, and customers continue to respond. To date, there are more than 60 Bell 429s operating throughout Latin America, and this demo tour follows last year’s Supplemental Type Certificate (STC) validation in Brazil for the MAGnificent interior from Mecaer Aviation Group (MAG). Bell Helicopter pilots will travel to a number of countries, including Chile, Argentina, Brazil, and more over the course of two months. “Bell Helicopter continues to be a trusted brand in the industry, and we are proud to showcase our aircraft to current and potential customers,” added Ortiz. Customers can customize the cabin interior of the Bell 429 MAGnificent to a variety of seating configurations, and choose from a wide range of Italian fabrics, colors and optional equipment. MAG’s specialty custom interior incorporates two proprietary products, a passive noise abatement system called SILENS, and an In-Flight Entertainment Enhanced Lounge (I-FEEL), which provides a fully customized interactive touch screen based entertainment, communication and flight information management system. The Bell 429 is one of the most advanced light twin helicopters ever developed, offering a fully integrated glass cockpit with advanced drive system and best-in-class Wide Area Augmentation System (WAAS) navigation and Instrument Flight Rules (IFR) capability. Additional safety features include a collective mounted throttle, damage tolerant hub and rotor system, and energy attenuating seats. It is the first helicopter certified through the Maintenance Steering Group (MSG-3) process, resulting in reduced maintenance costs for operation. For more information on the demo tour in the region, please contact the Regional Sales Manager in Latin America, Nicole Werneck. Hamburg, 31 March, 2016 – The world’s leading turboprop manufacturer ATR will attend, for the first time, Aircraft Interiors Expo in Hamburg, the largest event dedicated to the aircraft interiors industry, from 5th to 7th April 2016. This is also the first occasion where regional aviation will be represented at this important event, demonstrating industry’s increasing commitment to the wellness and comfort of passengers. Committed to continued innovation, ATR will be showcasing the Smart Galley, a new galley concept developed by ATR in response to the needs and expectations of the airline community. The new Smart Galley features an increased storage capacity while offering greater operational flexibility thanks to its quick and easy reconfiguration. This new concept allows airlines to improve aircraft efficiency by saving considerable weight and space in the aircraft cabin. The first Smart Galley will be installed on Lion Air’s regional airline Wings Air ATR 72-600, scheduled for delivery in May 2016. The new equipment will be available for line-fit installation as well as for retrofit on the fleet in-service. The Smart Galley will be displayed at Hall B6, Stand C61 and C70. Two Virtual Reality demonstrators will offer visitors a unique experience to make the Smart Galley configuration of their own. Besides displaying the new equipment, ATR will hold an agreement-signing ceremony on April 5th at 10:30am at the Business France Space. These events are open to the media attending the Aircraft Interiors Expo. MONTRÉAL, QUÉBEC–(Marketwired – April 1, 2016) – Bombardier Business Aircraft announced today that it has received a firm order for 20 Challenger 350 aircraft. For competitive reasons, the customer will remain undisclosed at this time. Based on the 2016 list prices for standard-equipped aircraft, the firm order is valued at approximately $534 million US. “With its outstanding performance and reliability, the class-leading Challenger 350 aircraft dominates the super-midsize segment and continually outperforms – it’s simply one of the best business jets in the market,” said David Coleal, President, Bombardier Business Aircraft. Defence and security company Saab announces that it has been awarded a contract to deploy Wide Area Multilateration (WAM) surveillance systems around the cities of Cucuta and Medellin for Aeronáutica Civil de Colombia (Aerocivil). Saab will be working with its local Colombian partner, Entelcom S.A.S., to install an array of its latest multilateration and ADS-B ground stations to provide surveillance of the Cucuta and Medellin approach sectors. ADS-B is the next generation of aircraft surveillance, which utilizes global navigation satellite systems to track aircraft positions. Saab’s system will improve the safety of flights operating in the visual corridor between Enrique Olaya Herrera Airport (SKMD) and José María Córdova International Airport (SKRG). Saab’s field-proven technology provides coverage in areas that are infeasible to reach with traditional radar. “Saab’s multilateration and ADS-B solutions provide air navigation service providers like Aerocivil with the critical surveillance they need while costing much less than radar-based solutions” explains Anders Carp, Head of Saab Traffic Management. Saab is the leading multilateration surveillance provider in the world and is responsible for more than half of all global installations. Saab provides the global defence and aviation markets with advanced sensor technologies, next-generation radars, ATC automation tools, and collaborative decision-making and efficiency solutions. It serves military, civil aviation, airport and airline customers in more than 40 countries across six continents.